Editor's Note: This review was created to serve as an updated, more thorough, and more expansive version of a 2013 article about our favorite chef's knives. There is no kitchen knife more important than a chef's knife, unless, of course, you're an Italian nonna, in which case you can probably break down a cow with a dull paring knife. But for all the rest of us, a chef's knife is where most of the action is. It is a true workhorse, useful for nearly any task. This is the knife you use to dice onions, chop carrots, smash garlic under its side, and cut up meat. Sure, there's a whole array of specialized knives you can invest in, but in a pinch, a sharp chef's knife can do most of their jobs more than well enough, whether that's slicing delicate fish, carving a turkey, or mincing a shallot. To find the best chef's knives, we tested 27 different ones, all with roughly eight-inch stainless steel blades and ranging in price from about $15 to just under $200. Eliminating the duds was easy, but picking among the top performers was far more difficult. At a certain point, the question becomes less about quality and more about personal preference—how does this knife feel in your hand? Keep that in mind as you read this review, since, while all our top picks aced the tests, so did several others. Read about all of the other contenders toward the bottom, and, if you can, visit local knife stores so you can feel the blades in your hands. What works for us may not be what works best for you. A deft and nimble blade, Misono's UX10 is one of the lightest-weight knives we tested. It's razor-sharp right out of the box and handled every task we threw at it with ease, dicing an onion as if it were as soft as a blob of Jell-O and making paper-thin slices of smoked salmon as if the knife were a true slicer. It's not a knife for beginners, though: Given its asymmetrical edge and difficult-to-sharpen steel, it takes skill and dedication (or a skilled local knife-sharpening service) to maintain the edge. Even lighter in weight than its more expensive sibling, the UX10, the Misono 440 offers an incredibly agile experience, with an especially sharp out-of-the-box blade. It handled all our testing tasks with ease. The price variance between this one and the more expensive UX10 mostly comes down to the steel used, a difference most home cooks won't likely notice, making this one a good intermediate choice. We were impressed by all the Mac knives in our testing, across their range of price points, but this Mac knife came out on top thanks to its combination of price and performance. While not inexpensive, it was one of the more affordable Japanese-made knives we tested. This blade is comfortable in the hand and has hollow-ground dimples to help reduce friction when cutting (which confers a small advantage for some tasks, such as thinly slicing delicate proteins like fish). Ask 10 experts what makes a great chef's knife, and you'll likely get 10 different answers. There's no one right answer in terms of the weight of a knife, the metal used, the handle design and material, the length of the blade, or much else. What can we say with certainty? Well, for starters, a knife should be sharp right out of the box. Sure, if you're skilled with a whetstone, you can always fix an edge or change its profile to suit your preferences, but that's advanced stuff. Most home cooks won't be making those kinds of adjustments, not right after buying the knife, and not any time after that either. If they take it to a local knife sharpener* once a year for a touch-up, it'll be a miracle. * Hopefully somewhere good and not one of those places where they grind away all the metal on a dry, coarse stone wheel. A knife should feel "balanced" as well, though that term is hard to define in any absolute sense. It's not so literal as to mean that the handle and blade should perfectly balance each other when set on a fulcrum right where they meet. Once again, it's something more personal than that—when you hold the knife, does the weight fall comfortably in your hand? Does it feel like it works with you, not against you? There are a lot of factors that can go into this, including the size of your hand, how you hold the knife, and how you use it. Some cooks might prefer a knife that feels heavier in the handle, some might want one that's slightly heavier in the blade, and others may want to get the sense that the knife floats naturally between the two. Of course, any knife should be well made regardless of its price point. The steel should be of good quality, the blade should be straight, and the handles, whether made of wood, resin, or some kind of plastic, should be solidly constructed, without any gaps, damage, or other obvious shortcomings. As for length, for this review we stuck to knives with roughly eight-inch blades, which is the most common size. Go any shorter, and you're getting into utility-knife territory, but longer is most certainly an option. For most people who cook, an eight-inch blade should be about right, but some people may prefer a longer, 10-inch blade. And even for those of us who tend to work with an eight-inch or 10-inch knife, there are some undertakings, such as cutting up a big old watermelon, for which it can be handy to have an even longer one. Still, an eight-inch knife can get just about any job done, including the big ones. One of the first decisions to make these days is whether to buy a Japanese knife or a Western one. These terms can be confusing, so it helps to explain how we're using them in this review, as well as some of the main differences between the two categories. Traditional Western knives tend to have taller, thicker, heavier blades with more of a curve. Before I go any further, this is probably a good time to issue a necessary disclaimer: The world of knives is a complicated one, with a huge range of metals, shapes, edge geometries, build styles, and more that can quickly overwhelm a shopper; I'm a professional, and even I can't be bothered to go as deep into the nitty-gritty details as some knife geeks do. Just remember that for nearly every rule of thumb, there's an exception, and for most strongly held opinions, there's an equally strongly held counter-opinion. To get through this review without turning it into a dissertation, I have to paint in broad strokes, which inevitably means oversimplifying things. Please keep that in mind before firing off a "Yes, but" comment or email. The "chef's" knife, as a shape, is originally a Western one. The most famous are German-style chef's knives, which have thicker, heavier blades that curve up significantly toward the tip. This makes for a knife that's better suited to a rocking-chop motion, such as when you rock the blade back and forth over a pile of tender herbs to mince them. There are other European knife traditions, such as French knives, that have a similar chef's-knife design that's only slightly less curved. Another common feature of Western knives is a double-bevel edge, meaning that the edge tapers in evenly on both sides to a fine point, similar to the letter V. This sharpening geometry trades in a bit of sharpness for a little more robustness. Western knives are also often made with slightly softer steel, which can make sharpening easier and honing a more effective maintenance method (because the steel can more easily be bent back into alignment). Japanese chef's knives are lighter, thinner, and straighter than their Western counterparts. Traditionally, Japanese knives do not have a shape comparable to that of the Western chef's knife. Instead, there's a staggering variety of shapes and sizes that vary based on region, each one specially designed for its task, from fish-filleting knives to vegetable-cutting knives to sashimi-slicing knives to noodle-cutting knives to blowfish knives, eel knives, shellfish knives, and more. Most of those knives are sharpened with a single edge (also called a chisel bevel), meaning that the knife tapers from the spine to the edge on only one side. (This also means that the knives are exclusively either right- or left-handed.) A chisel bevel can reach superior levels of sharpness, but is more prone to chipping if used improperly. A Western-style Japanese knife has a straighter edge and lighter weight than a true Western one; the steel is usually harder as well, meaning a honing steel is not an effective method of maintaining the edge between sharpenings. Around the middle of the 20th century, Japanese knife makers began making knives that were more Western in style, including a chef's knife known as a gyutou. These are the Japanese chef's knives I'm including in this review. Gyutou and other Japanese knives are generally made with harder steel, which can hold an edge longer but can also be more difficult to sharpen. They're also much less well suited to being used with a honing steel, since the more brittle metal doesn't bend in the same ways. Three basic edge geometries common to traditional Western, traditional Japanese, and Western-style Japanese knives. Adding to the challenge, most Western-style Japanese knives have a double bevel that's asymmetrical—the blade edge is sharpened on both sides, as in Western knives, but it's not sharpened at the same angle on both sides the way a true Western chef's knife is. This means that Western-style Japanese knives can often be a little sharper, but are also intended to be used in either the right or left hand. They're more forgiving in terms of handedness than traditional Japanese knives—it's possible to use them in the non-intended hand, but doing so is not ideal. Lefties should make sure the Japanese knives they buy are sharpened with a left-handed edge geometry. Japanese chef's knives are also less curved than the German style, trending more in line with a French knife profile. This makes them less adept at the rock-chop (though they can still be used that way), and more adept at a pulling stroke. In terms of weight, Western-style Japanese knives also tend to be lighter and more fragile, making them an inappropriate choice for heavy-duty tasks, like hacking away at bones and such. If there's one takeaway here, it's that casual home cooks are arguably better off getting a Western chef's knife, since they're more robust and easier to maintain. For professionals and hobbyists interested in going deeper into edge geometry and whetstone sharpening, a Japanese knife can be a very compelling purchase. Exploring the finer points of knife construction and materials is interesting and, of course, useful to know, but ultimately the test of a knife is how well it performs in the kitchen. Since most home cooks just want a knife that does a good job out of the box, that's a quality we decided was of utmost importance—if a knife arrived with flaws, including fixable ones like a dull blade, we wouldn't recommend it. To test the chef's knives, we examined each knife for flaws in the build quality, weighed them, took note of their specs, checked their out-of-the-box edge sharpness, and put them through a series of basic and common cooking tasks. We then finished with another edge-sharpness test to see if any had experienced a noticeable loss in cutting ability after the testing. I did much of the testing, but I'm a man who's nearly six feet tall, and left-handed. To make sure this review took into account another opinion, I asked Sohla to use all the knives also; she's shorter than me and has smaller hands, plus she's right-handed. The knives that we ended up recommending are ones that we both approve of, which should help cover a more diverse range of cooks and hand preferences. It's worth noting that, while we looked at a large number of both Western and Japanese chef's knives, there are a few Western and many Japanese producers that were not included in this review. It just wasn't possible to try every brand out there. The knives we did test represent some of the most common and well-known brands available in the United States, but there are many other brands worth checking out, particularly if Japanese knives are of interest to you. The first and last tests for this review were to check the sharpness of each blade. I did this by running each knife through sheets of parchment paper from heel to tip, checking to make sure each could slice the paper without snagging and tearing it. While it's not a test that's precise enough to rank all the blades in exact order of sharpness, it is possible to feel how smoothly each one passed through the paper. Generally speaking, the Japanese knives moved through the paper with the least resistance, indicating a higher degree on average of out-of-the-box sharpness. Still, several of the Western knives were able to cleave through the paper without a hitch, indicating an acceptable level of sharpness. Any blade that snagged or tore the paper repeatedly was disqualified. After all the other tests, I ran the finalists through the paper once more, just to see if any had lost the ability to slice through it after use. All the finalists aced the final paper-cutting test. It's hard to imagine testing chef's knives without dicing some onions. I spent some time with each knife, halving the onions, trimming their ends, peeling them, and dicing them both coarsely and finely. This helped eliminate some knives. There were ones that crunched through the onions instead of slicing them, despite my best efforts to use the blade's sharpness to accomplish the task; those were disqualified. There were others that revealed individual weaknesses, such as knives with overly long handles that bumped and prodded my forearm as I worked. Those, too, got the axe. A tomato is yet another classic way to test a blade's edge: The skins are taut and slippery, while the inside is soft and easily mangled. A good knife will slide through the skin without trouble, then shave down through the tomato flesh without crushing it. Most of the knives that hadn't already been eliminated performed decently well on this test; some excelled at it, while others got the job done without any obvious problems. The fact that most of the remaining knives did well here indicates that the initial paper test and the onion test had already eliminated the most problematic blade edges, at least as far as sharpness was concerned. Paper, onions, and tomatoes are all great for checking the sharpness of an edge, but it takes a hard, dense vegetable like a carrot to expose problems in a knife's geometry. A well-designed and sharp knife can slice a carrot all the way through, leaving perfectly flat cut faces on the vegetable. Knives that are too wedge-shaped, or that have some other design or edge shortcoming, however, have a tendency to crack the carrot before finishing the stroke, much the way an axe can split wood all the way through even if the axe itself gets stuck halfway. The telltale sign of a crack: a rough and uneven face on the sliced carrot instead of a smooth and even one. To test the knives, I cut the carrots both crosswise into rounds and lengthwise into halves and quarters. I also diced them, and cut them into thin sheets, stacked those sheets to cut julienne, and cross-cut the julienne to make a brunoise. Any knife that was prone to splitting carrots instead of slicing them, or otherwise had trouble with these basic cuts, didn't move on to the next round. 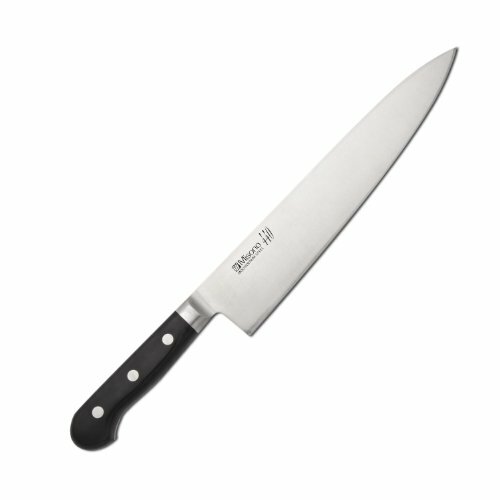 A chef's knife is frequently used to cut up meats and other proteins. I could have butchered a bunch of chickens, but that seemed like too easy of a task: Any knife that had made it this far wasn't going to have much trouble with chicken, not even the squirmy skin. I needed something more challenging, and to that end, I opted for a side of smoked salmon—a delicate protein if ever there was one. Normally, a chef's knife would not be the tool of choice for slicing smoked salmon. A slicing knife, with its thin and flexible blade, is much better suited to the task. But not everyone keeps a sharp slicer in their knife collection. In a pinch, a chef's knife should be able to do the job at least decently well. All the knives that were still in the running at this point sliced the salmon acceptably well. Overall, though, a divide opened up between the Japanese and Western knives in this test, with the Japanese ones tending to outperform the Western knives. This isn't shocking: As I mentioned above, on average, Western chef's knives are thicker, heavier, and wider than their Japanese counterparts, making them less well-equipped to handle such a delicate task like this. The thin, sharp blades of Japanese chef's knives are closer in form to those of slicing knives than Western ones are. That doesn't make the Western knives worse in a larger sense (a bone-chopping test would expose the fragile Japanese knives as less adept at that task), but it does help illustrate their relative advantages and disadvantages. Sometimes a chef's knife has to work its way through a large, tough fruit or vegetable. To make sure we considered that situation, we sliced our way through a case of pineapples, trimming the skins and tops, carving away the pineapple's tough eyes, and then cutting the fruit into smaller pieces. Because of the contortions necessary to work around a larger piece of food like this, the test singled out even more knives that had awkward designs—ones whose handles got in the way or whose blades felt dull. Our top picks performed well in all the tests, and passed muster with two professional cooks, a lefty and a righty, with both larger and smaller hand sizes. We ended up selecting three knives from each overarching group (Western and Japanese), at high, middle, and low price points. Keep in mind that those terms are relative; none of the Japanese knives we tested are cheap. Wüsthof is one of the leading brands of German knives, and its Classic chef's knife proved that it's still worthy of consideration for any knife collection. The design is...well, as the name says, it's classic. The blade itself is forged high-carbon stainless steel with a full tang that extends the length of the riveted handle. It was decently sharp—certainly sharp enough for just about any task a home cook would need it for—though it didn't match the sharpness on the Japanese blades. Once made of wood, the handle is now made of polyoxymethylene, a durable type of plastic that won't crack or degrade with extended use or when exposed to moisture. The full bolster on the Wüsthof Classic (bottom) runs from the handle to the heel of the blade, while the half bolster on the Mercer Culinary Genesis (top) only buttresses the blade where it meets the handle. Opinions are divided about the merits and disadvantages of a full bolster. This knife weighed in at 264 grams, making it one of the heavier ones in our tests, but, unlike with some of the other clunkers in the group, the Wüsthof's blade didn't feel overly leaden or clumsy. It has a full bolster, which means that a thicker portion of metal runs from the handle down to the heel of the blade. People are divided about whether that's a good thing. The full bolster can feel nice to hold on to when you're gripping up on the blade, but it can also make sharpening more difficult. For those who don't want a full bolster, Wüsthof makes several other lines of knives without it that might be worth considering. This chef's knife from Mercer, a North American producer that specializes in German-style kitchen knives, did well in all the tests. A common knife in culinary schools in the United States, the Genesis has a full tang that extends all the way into the grippy handle, made from a material called Santoprene, which combines rubber with plastic. The blade excelled in all the vegetable-slicing and -dicing tests, though it did snag a little more than the other finalists on the smoked salmon (though, again, this is partly just the result of its wider, thicker German-style blade). I'd describe this knife as a good starter blade, one that you can get away with mistreating just a little, or a good backup knife to keep on hand for friends (and spouses) who haven't earned the privilege to touch the better knives in your collection. This list wouldn't be complete without at least one truly inexpensive knife. For that honor, the Mercer Culinary Millennia chef's knife came out on top. Its stamped blade has an impressive edge for the price, holding its own against knives that cost several times as much. Obviously, though, the build quality isn't as good. The molded plastic handle (also made from Santoprene, like the Mercer Culinary Genesis) is large and easy to grip. If you were being generous, you'd say it's an ergonomic handle design, but in truth, it felt a little too chunky when I was gripping up on the blade, which is how we always use our chef's knives. Still, for the price, it's a hard knife to top, and one you should feel comfortable using however you damn well please, whether that's dicing an onion or hacking away at lobster shells. 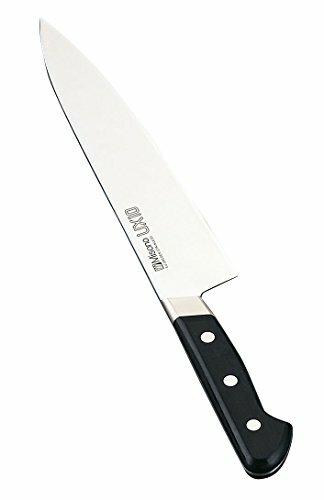 Misono is one of the better-known Japanese knife brands in the States, having built up a reputation among chefs for many years now. This knife, the UX10, is its top-of-the-line model, and one that both Kenji and Sohla have sworn by. Made from very hard Swedish (read: pure) stainless steel, the knife will hold its edge longer than many, requiring less frequent sharpening—though, when it does come time to sharpen, that hard steel is going to require a bit more skill than most. It also has a nickel silver bolster that claims to be more resistant to corrosion. If I were to lodge one personal complaint about that bolster, it would be that it's designed with some sharp angles that, while attractive, sometimes press uncomfortably into my hand during use. Keep in mind that the edge is sharpened asymmetrically, which means lefties like me should make sure to get one that has the more extreme angle on the other side. Aside from some small design differences between this knife and the UX10 (including a less severely angled bolster here, which I prefer), the main difference between these knives is the type of steel used—though it's a difference that's hardly noticeable unless you spend a lot of time using and sharpening the knife on a whetstone, and even then, I'm not sure just how obvious it is. Overall, this blade is made from hard steel that, similar to the UX10, will hold an edge but is also more difficult to sharpen. Once again, this is an asymmetrical bevel, meaning lefties should make sure to get one that's been adjusted for their use. Like most other Japanese knives, this one is relatively thin and lightweight, at 171 grams, roughly five to 10 grams heavier than the Misono options. Unlike most other Japanese knives, the Mac knives are supposed to have a symmetrical edge, meaning the knives should work equally well for right- and left-handed users, which can be a big plus in terms of sharpening ease for those who are less skilled at it. It can also be helpful in home kitchens, where you may have both righties and lefties using the same knives. The Mac Knife Professional Hollow Edge Chef's Knife is a top-notch performer with a high-quality build. Tojiro's DP Damascus Chef's Knife is an attractive blade with a great edge. It feels a little clunkier than the Misono and Mac knives, but is still an excellent choice. In general, Tojiro's DP line is among the ones we use most often in the Serious Eats test kitchen: The knives are well made, sharp, and affordable, if just a tiny bit clunky. The Gyutou performed well in all the tests. Mercer's Culinary MX3 Premium San Mai VG-10 Steel Core Blade is the company's stab at a more Japanese-style design. It performed well, although something about the shape of the blade near the tip made me feel at times like I might accidentally cut myself, despite using the claw on my guiding hand. Shun's VB0706 Sora Chef's Knife came as a surprise to me: The knife is sharp and easy to use, and moderately priced to boot. Mac's Chef Series Slicing Chef's Knife doesn't feel as sharp or accurate as the other Mac options, but it's the most affordable. Given its reasonable price, it's a very worthy option. For years, media outlets have recommended the Victorinox Fibrox Pro Chef's Knife as one of the best affordable chef's knives on the market. They're not wrong, but we ultimately couldn't make it one of our top affordable picks, because the price is quite a bit higher than that of several other knives of a comparable quality level. The Miyabi Kaizen Chef's Knife was knocked out of the running after consistently falling short due to a blade edge that wasn't nearly sharp enough. Messermeister's Meridian Elite Chef's Knife was disqualified after failing the initial paper-cutting test. Sabatier is one of the most famed French kitchen-knife makers, and decades ago its blades were worthy of the reputation. But quality has clearly fallen, as its French Forged Stainless Chef Knife had a surprisingly dull edge right out of the box. J. A. Henckels' International Classic snagged repeatedly on the paper-cutting test. Messermeister's Four Seasons Chef's Knife also wasn't able to successfully slice through a sheet of parchment paper, earning it an early disqualification. The long handle on the Wüsthof Pro Cook's Knife kept getting in the way, bumping into our forearms as we tried to cut with it. It'd work fine if you held it by the handle only and not at all up on the blade, but that's not how we hold a knife, nor how we recommend holding one. Rada Cutlery's French Chef Knife was a particularly poor specimen, with a dull edge and low-quality construction. Not recommended at all. Shun's DM0706 Classic is a good and handsome knife with a very sharp blade, but we had trouble adjusting to its heavy handle. Wüsthof's Classic Uber Cook's Knife has a dramatically curved blade belly that we found very awkward to use. The Wüsthof Classic Ikon Cook's Knife is another knife whose overall quality is good, but in which the handle design caused it to awkwardly bump our forearms during use. Global knives are a divisive brand: People either love them or hate them. For years I was in the hate group, but I've recently come around a bit on them, thanks to a Global utility knife I sometimes use at home. Still, its G-2-8 Chef's Knife felt sluggish in my hand when dicing an onion. If you tend to like these knives, though, you'll probably like this one. 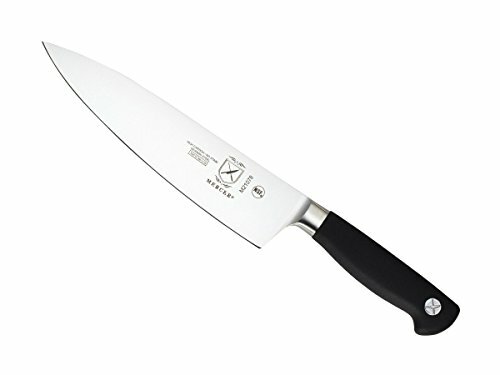 Mac's Professional French Chef's Knife was a great blade with excellent performance, but Mac has several other offerings that we felt offered more bang for their buck. The Zwilling J. A. Henckels Twin Four Star II Chef's Knife performed well on almost all the tests, until it was time to cut the carrots, at which point it cracked them repeatedly instead of slicing through them cleanly. We've been big fans of Misen's Chef's Knife ever since the brand launched on Kickstarter a few years ago. The design is smart, streamlined, and incredibly comfortable to hold, and the knife strikes a nice balance between some of the heavier German-style knives and the featherweight Japanese ones. Where it tripped up was on the blade sharpness: It sported an excellent edge from the heel up to where the curvature began, but from there to the tip it was off, snagging on parchment paper and failing to glide through an onion as smoothly as it should have. Given that Misen is still a new brand, this likely speaks to some quality-control issues that need to be sorted out with its manufacturer. If and when it can perfect the blade edge so that it's consistently as good as the competition, it'll have a good chance of being a top pick.